A CTD (conductivity, temperature, and depth) instrument comes up from the depths of the Chukchi Sea. Aboard the USCGC Healy. This is an observational research program evaluating changes in the Pacific Arctic ecosystem in response to sea ice declines and other climate related processes. 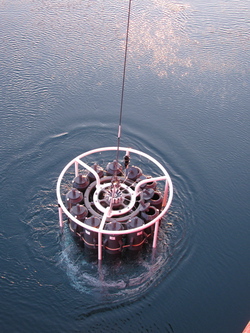 The approach is to undertake repeat sampling of specific locations that are biologically diverse or rich in production to detect change, and also to use the capabilities aboard the USCGC Healy to undertake process oriented experiments that address specific issues such as ocean acidification, changes in biological productivity and other areas of sampling that can be addressed by shipboard sampling and experimentation. 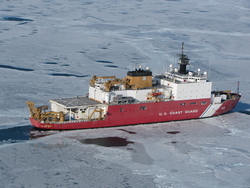 An aerial view of the USCGC Healy in the Chukchi Sea. They will be ship-based aboard the USCGC Healy in the northern Bering and Chukchi Seas. That is absolutely correct! I was just reading a study that talks about human sexual dimorphism and how it is decreasing over evolutionary time...might be interesting to look into!